Mark Dubowitz is the executive director of the Foundation for Defense of Democracies (FDD), an Israeli Likud Party-aligned think tank founded in the wake of the 9/11 attacks that has led efforts to push for U.S. military intervention in the Middle East and pro-Israel foreign policies. Dubowitz frequently appears in the media, discussing U.S. Middle East policy or writing op-eds for outlets like the Wall Street Journal’s neoconservative-oriented editorial page. The main target of Dubowitz’s invective is Iran, which he has long argued is on the verge of collapse if only the United States would intervene more aggressively. In an earlier Wall Street Journal op-ed, Dubowitz argued that Donald Trump should “take a page from the playbook Ronald Reagan used against the Soviet Union” in its efforts to bring about regime change in Tehran. He wrote: “Reagan’s policy was outlined in 1983 in National Security Decision Directive 75, a comprehensive strategy that called for the use of all instruments of American overt and covert power … Mr. Trump should call for a new version of NSDD-75 and go on offense against the Iranian regime.” Among the specific steps Dubowitz urged Trump to take were “massive economic sanctions,” “working closely with allied Sunni governments,” and “a more muscular covert action plan,” which he claimed that CIA Director Mike Pompeo was already working on. After the election of Donald Trump, who had vowed at first to scrap the Iran nuclear deal and later to “fix it,” Dubowitz advocated a strategy that would put the deal in jeopardy but would not pull the United States out immediately. This would, he contended, give the U.S. time to “fix” the deal. “You change (the deal) by making very clear to Iran that the United States, as a matter of U.S. policy and U.S. law, is not going to accept a deal that cannot be verified,” he told National Public Radio. “And so the administration is now going to be rolling out a comprehensive Iran policy. It’ll be a pressure campaign using all instruments of American power … it needs financial and economic power. It needs more sanctions. It means using military power to roll back and subvert Iranian aggression in the region. It means using political power and covert action.” In that interview, Dubowitz alleged that “In fact, Iran is denying access for inspectors to its military sites, which actually contravenes the very language of the deal. So you have to understand Iran is not fully implementing the deal.”  Dubowitz offered no substantiation for this allegation, nor any explanation of why the International Atomic Energy Agency, the other parties to the agreement, and even President Trump had all agreed that Iran was, at minimum, in compliance with the letter of the agreement. Said Greg Thielmann of the Arms Control Association: “The report does not offer a realistic formula for negotiating a satisfactory agreement on limiting Iran’s nuclear program. It would require Iran to capitulate on virtually all fronts.” He added: “Some of the measures it suggests would be likely to disrupt P5+1 unity … and the maximalist requirements it cites for an agreement could convince Tehran that the U.S. objective is regime change, rather than full compliance with its obligations to the IAEA.” Thielmann also commented that the report’s near-omission of Israel, the only nuclear weapons power in the region, was “conspicuous” given its broad scope. Later that month, Iran and international negotiators announced that they had reached an interim agreement in which Iran would limit its enrichment activities and allow more inspections of its facilities in exchange for light sanctions relief and a pledge by Western powers not to impose more sanctions while a final agreement was negotiated. Political pragmatists generally praised the deal. Despite Dubowitz’s vociferous criticism of the interim nuclear agreement, in March 2013 he co-authored a Wall Street Journal piece with David Albright and Orde Kittrie that called for many of the same limitations on Iran’s nuclear program that were reached in the November 2013 accord. “In addition to curtailing Iran’s production and stockpile of 20%-enriched uranium, any interim deal must verifiably prohibit Iran from upgrading the type and increasing the number of its operational centrifuges,” they wrote, “more frequent IAEA inspections at key Iranian sites are also essential.” The authors added: “We estimate that Iran, on its current trajectory, will by mid-2014 be able to dash to fissile material in one to two weeks unless its production of 20%-enriched uranium is curtailed.” The November 2013 Joint Plan of Action secured most of these restrictions, including stopping Iranian enrichment at the 20 percent level and eliminating Iran’s stockpiles of 20 percent enriched uranium. 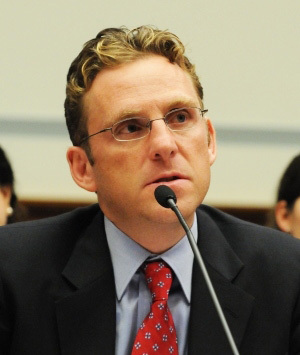 At a panel discussion co-hosted by the neoconservative Foreign Policy Initiative and the Bipartisan Policy Center in October 2014, Dubowitz joined Ray Takeyh, Harvard’s Olli Heinonen, and David Albright in criticizing aspects of the Obama White House’s approach to Iran. “We’ve given away those four major concessions as part of JPOA [2013 interim nuclear agreement], and now we’re negotiating with the Iranians over a comprehensive plan of action, having conceded four major chips,” Dubowitz said at the talk. 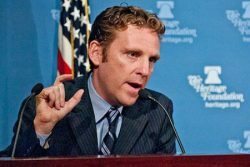 Dubowitz pushed Congress to impede efforts by the Obama administration to reach a comprehensive nuclear agreement with Iran by “designing a ‘sanctions defense’” that would limit President Obama’s ability to suspend sanctions on Iran. “This will signal to the administration how much it can give up in the negotiations,” Dubowitz said in December 2014. Dubowitz supported Israeli Prime Minister Benjamin Netanyahu’s controversial speech before Congress to challenge President Obama’s nuclear negotiations with Iran in March 2015. “The Obama position has gone from dismantle and disclose to disconnect and defer. They have squandered their negotiating leverage to an Iranian regime that entered negotiations with a weak hand and looks likely to get what it also wanted,” he told the Free Beacon after the speech. On Syria—another part of Dubowitz’s portfolio at FDD—Dubowitz has endorsed military action outright. Dubowitz said he joined FDD to help manage its administration and finances. Since then, however, he has become heavily involved in pushing Iran sanctions and other aggressive policies. He has helped lead numerous FDD projects, including its Iran Energy Project, Iran Human Rights Project, and Syria Working Group. Foundation for Defense of Democracies, “Mark Dubowitz: “At a Minimum, a Nuclear-Armed Iran Will be Emboldened to Accelerate its Aggressive,” March 4, 2015, http://www.defenddemocracy.org/media-hit/mark-dubowitz-at-a-minimum-a-nuclear-armed-iran-will-be-emboldened-to-accel/. Eli Clifton and Ali Gharib, “The Iranophobia Lobby Machine,” The Investigative Fund, July 17, 2014, http://webcache.googleusercontent.com/search?q=cache:nHKNNfx7tYMJ:www.theinvestigativefund.org/investigations/politicsandgovernment/2002/the_iranophobia_lobby_machine+&cd=14&hl=en&ct=clnk&gl=us. Ali Gharib, “Who’s Dismissing the Iranian Elections,” Open Zio, The Daily Beast, June 17, 2013, http://www.thedailybeast.com/articles/2013/06/17/who-s-dismissing-the-iranian-elections.html. Reuel Marc Gerecht and Mark Dubowitz, “The Logic of Our Iran Sanctions,” Weekly Standard, January 3-10, 2011, http://www.weeklystandard.com/print/articles/logic-our-iran-sanctions_524860.html?page=2. Bloomberg Business, “Economic Regime-Change Can Stop Iran Bomb: Gerecht and Dubowitz,” January 17, 2015, http://www.bloomberg.com/news/articles/2012-01-17/economic-regime-change-can-stop-iran-commentary-by-gerecht-and-dubowitz. Albright et al, “U.S. Nonproliferation Strategy for the Changing Middle East,” The Project on U.S. Middle East Nonproliferation Strategy, January 2013, http://www.defenddemocracy.org/content/uploads/documents/Nonpro-FinalReport.pdf. Jim Lobe, “New Push in U.S. for Tougher Sanctions, War Threats Against Iran,” Inter Press Service, January 15, 2013, http://www.ipsnews.net/2013/01/new-push-in-u-s-for-tougher-sanctions-war-threats-against-iran/. Reuel Marc Gerecht and Mark Dubowitz, “The Case for Stronger Sanctions on Iran,” Wall Street Journal, November 10, 2013, http://online.wsj.com/news/articles/SB10001424052702304644104579189714065263216. Sina Toossi, “Iranian Nuclear Deal: Hardliners Despair, Pragmatists Rejoice,” Foreign Policy In Focus, November 26, 2013, http://fpif.org/iranian-nuclear-deal-hardliners-despair-pragmatists-rejoice/. Mark Dubowitz and Orde Kittrie, “A Bad Agreement Likely to Get Worse,” Wall Street Journal, November 24, 2013, http://online.wsj.com/news/articles/SB10001424052702303281504579218003620680432. David Albright, Mark Dubowitz, and Orde Kittrie, “Stopping an Undetectable Iranian bomb,” The Wall Street Journal, March 26, 2013, http://www.wsj.com/articles/SB10001424127887324789504578380801062046108. Arms Control Association, “Implementation of the Joint Plan of Action at a Glance,” February 2015, https://www.armscontrol.org/Implementation-of-the-Joint-Plan-of-Action-At-A-Glance. Mark Dubowitz, “Negotiations on Iran’s Nuclear Program,” Testimony to Senate Foreign Relations Committee, February 4, 2014, http://www.defenddemocracy.org/media-hit/negotiations-on-irans-nuclear-program/. Tim Starks, “Five Questions with Mark Dubowitz on Iran Nuclear Negotiations, Sanctions, Roll Call, July 7, 2014, http://blogs.rollcall.com/five-by-five/five-questions-with-mark-dubowitz-on-iran-nuclear-negotiations-sanctions/. Reuel Marc Gerecht and Mark Dubowitz, “Reuel Marc Gerecht and Mark Dubowitz: Iran ignores a lucrative deal over its nuclear activities,” The Washington Post, August 10, 2014, http://www.washingtonpost.com/opinions/iran-ignores-a-lucrative-deal-over-its-nuclear-activities/2014/08/08/32ef5c96-1ef0-11e4-ab7b-696c295ddfd1_story.html. Foreign Policy Initiative, “IRAN EXPERTS: NO DEAL IS BETTER THAN A BAD DEAL,” October 9, 2014, http://www.foreignpolicyi.org/content/iran-experts-no-deal-better-bad-deal. Mark Dubowitz, “Congress: The Last Line of Defense in the Iran Talks,” Foundation for Defense of Democracies, December 12, 2014, http://www.defenddemocracy.org/media-hit/dubowitz-mark-congress-the-last-line-of-defense-in-the-iran-talks/. Adam Kredo, “Experts: U.S. Concessions Give Iran a Clear Path to Nuclear Bomb,” Free Beacon, March 4, 2015, http://freebeacon.com/national-security/experts-u-s-concessions-handing-iran-a-clear-path-to-nuclear-bomb/. Mark Dubowitz, “Why You Shouldn’t Get Too Excited About Rouhani,” The Atlantic, June 17, 2013, http://www.theatlantic.com/international/archive/2013/06/why-you-shouldnt-get-too-excited-about-rouhani/276912/. Ali Gharib, “Who’s Dismissing the Iranian Elections,” Open Zion, The Daily Beast, June 17, 2013, http://www.thedailybeast.com/articles/2013/06/17/who-s-dismissing-the-iranian-elections.html. Sun News Network, “Mark Dubowitz Discusses Sanctions To Iran And The War In Syria,” https://www.youtube.com/watch?v=O4ZgHi8zZGk. Yitzhak Benhorin, “The man who fights Iran,” Ynet.com, April 26, 2011, http://www.ynetnews.com/articles/0,7340,L-4060499,00.html. Emily Cadei, “The Wonks Waging Financial War on Iran,” Ozy, January 22, 2014, http://www.ozy.com/rising-stars-and-provocateurs/washingtons-iran-sanctions-brain/4912.article. Foundation for Defense of Democracies, “Our Team: Mark Dubowitz,” http://www.defenddemocracy.org/about-fdd/team-overview/dubowitz-mark. Eli Clifton and Ali Gharib, “The Iranophobia Lobby Machine,” The Investigative Fund, July 17, 2014,http://webcache.googleusercontent.com/search?q=cache:nHKNNfx7tYMJ:www.theinvestigativefund.org/investigations/politicsandgovernment/2002/the_iranophobia_lobby_machine+&cd=14&hl=en&ct=clnk&gl=us. Ali Gharib, “Who’s Dismissing the Iranian Elections,” Open Zio, The Daily Beast, June 17, 2013,http://www.thedailybeast.com/articles/2013/06/17/who-s-dismissing-the-iranian-elections.html. Reuel Marc Gerecht and Mark Dubowitz, “The Logic of Our Iran Sanctions,” Weekly Standard, January 3-10, 2011,http://www.weeklystandard.com/print/articles/logic-our-iran-sanctions_524860.html?page=2. Bloomberg Business, “Economic Regime-Change Can Stop Iran Bomb: Gerecht and Dubowitz,” January 17, 2015,http://www.bloomberg.com/news/articles/2012-01-17/economic-regime-change-can-stop-iran-commentary-by-gerecht-and-dubowitz. Jim Lobe, “New Push in U.S. for Tougher Sanctions, War Threats Against Iran,” Inter Press Service, January 15, 2013,http://www.ipsnews.net/2013/01/new-push-in-u-s-for-tougher-sanctions-war-threats-against-iran/. Reuel Marc Gerecht and Mark Dubowitz, “The Case for Stronger Sanctions on Iran,” Wall Street Journal, November 10, 2013,http://online.wsj.com/news/articles/SB10001424052702304644104579189714065263216. Sina Toossi, “Iranian Nuclear Deal: Hardliners Despair, Pragmatists Rejoice,” Foreign Policy In Focus, November 26, 2013,http://fpif.org/iranian-nuclear-deal-hardliners-despair-pragmatists-rejoice/. Mark Dubowitz and Orde Kittrie, “A Bad Agreement Likely to Get Worse,” Wall Street Journal, November 24, 2013,http://online.wsj.com/news/articles/SB10001424052702303281504579218003620680432. Arms Control Association, “Implementation of the Joint Plan of Action at a Glance,” February 2015,https://www.armscontrol.org/Implementation-of-the-Joint-Plan-of-Action-At-A-Glance. Mark Dubowitz, “Negotiations on Iran’s Nuclear Program,” Testimony to Senate Foreign Relations Committee, February 4, 2014,http://www.defenddemocracy.org/media-hit/negotiations-on-irans-nuclear-program/. Tim Starks, “Five Questions with Mark Dubowitz on Iran Nuclear Negotiations, Sanctions, Roll Call, July 7, 2014,http://blogs.rollcall.com/five-by-five/five-questions-with-mark-dubowitz-on-iran-nuclear-negotiations-sanctions/. Foreign Policy Initiative, “IRAN EXPERTS: NO DEAL IS BETTER THAN A BAD DEAL,” October 9, 2014,http://www.foreignpolicyi.org/content/iran-experts-no-deal-better-bad-deal. Adam Kredo, “Experts: U.S. Concessions Give Iran a Clear Path to Nuclear Bomb,” Free Beacon, March 4, 2015,http://freebeacon.com/national-security/experts-u-s-concessions-handing-iran-a-clear-path-to-nuclear-bomb/. Mark Dubowitz, “Why You Shouldn’t Get Too Excited About Rouhani,” The Atlantic, June 17, 2013,http://www.theatlantic.com/international/archive/2013/06/why-you-shouldnt-get-too-excited-about-rouhani/276912/. Ali Gharib, “Who’s Dismissing the Iranian Elections,” Open Zion, The Daily Beast, June 17, 2013,http://www.thedailybeast.com/articles/2013/06/17/who-s-dismissing-the-iranian-elections.html.